Logitech Z623 2.1 speakers review - this high quality THX-Certified audio system performs very well and is great for home users looking for an affordable quality sound system for their PC. In this review we are going to show you how the Logitech Z623 sounds when bass is tested to the max and some other basics for this sound system. 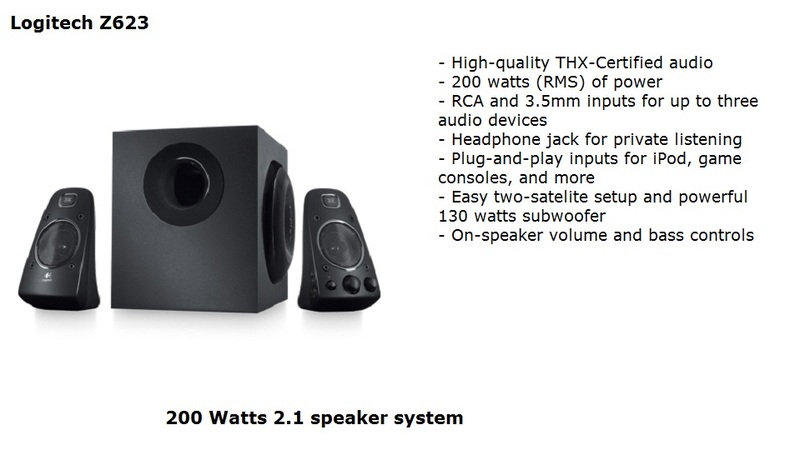 Logitech Z623 consists of one powerful subwoofer and two satellite speakers. The maximum power output is 200 watts (RMS). Logitech Z623 performs well with all the basic stuff at home like watching movies, playing games and listening some music. The sound is bold and clear but if you like to listen your music louder than you may need to look at some of the more powerful speaker systems. The price for this quality 2.1 sound system isn't high at all. You can easily find it for around $120-150 which is not exactly cheap but it looks like a good deal considering the good sound capabilities of the Logitech Z623 speaker system. If you are lucky you can find it manufacturer refurbished for under $100.